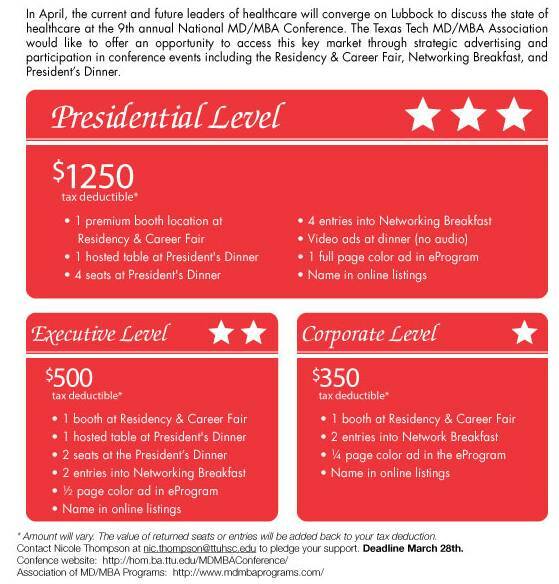 Non-Clinical Physician Jobs, Careers, and Opportunities: Promote YOUR Business at the 9th Annual MD/MBA Conference! Promote YOUR Business at the 9th Annual MD/MBA Conference! The 9th Annual MD/MBA Conference is just around the corner! Join us April 8-10, 2011, in Lubbock, Texas for a spectacular conference hosted by Texas Tech University! This will be a great opportunity to network with other leaders in your field and find out about career opportunities. If you haven’t registered yet, you may do so here. This is a terrific marketing opportunity for your company! Click here for more information about the different sponsorship packages available, and email me if you’re interested in a sponsorship or have any questions. The deadline is March 28. I hope you will join me in helping to make this conference a success. See you in Lubbock!